(Nanowerk News) University of New South Wales scientists have developed a highly efficient oxygen-producing electrode for splitting water that has the potential to be scaled up for industrial production of the clean energy fuel, hydrogen. The new technology is based on an inexpensive, specially coated foam material that lets the bubbles of oxygen escape quickly. "Our electrode is the most efficient oxygen-producing electrode in alkaline electrolytes reported to date, to the best of our knowledge," says Associate Professor Chuan Zhao, of the UNSW School of Chemistry. "It is inexpensive, sturdy and simple to make, and can potentially be scaled up for industrial application of water splitting." The research, by Associate Professor Zhao and Dr Xunyu Lu, is published in the journal Nature Communications ("Electrodeposition of hierarchically structured three-dimensional nickel–iron electrodes for efficient oxygen evolution at high current densities"). Unlike other water electrolysers that use precious metals as catalysts, the new UNSW electrode is made entirely from two non-precious and abundant metals - nickel and iron. 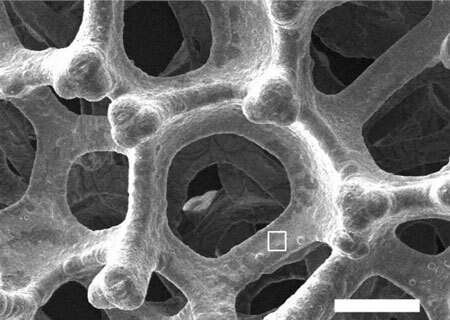 This ultra-thin layer of a nickel-iron composite also has tiny pores in it, about 50 nanometres across. "The three-dimensional architecture of the electrode means it has an enormous surface area on which the oxygen evolution reaction can occur," says Associate Professor Zhao. "The larger bubbles of oxygen can escape easily through the big holes in the foam. As well, the smaller holes make the electrode surface 'wetter', so the bubbles do not stick to it, which is a common problem that makes electrodes less efficient." "I think this electrode has great potential for the industrial-scale production of hydrogen. Our next goal is to understand the science behind it and to further improve its performance. Cleaner sources of fuel like hydrogen will be particularly important for reducing carbon dioxide emissions and solving the air pollution problems from the burning of fossil fuels such as coal," says Associate Professor Zhao.